One step at a time: It’s the only way we can live our lives. We can expect the unexpected, do the unthinkable and pursue the unknown, but no matter who or what marks our simple individual existence, everything happens moment by moment, step by step. Life doesn’t have a fast-forward button. It happens in moments – we call them seconds and minutes, heartbeats and daydreams. Cotton Mather’s “Girl with a Blue Guitar” is about much more than living life one step at a time, but this is perhaps an easy way to approach the deceptively simple, multi-layered love song. 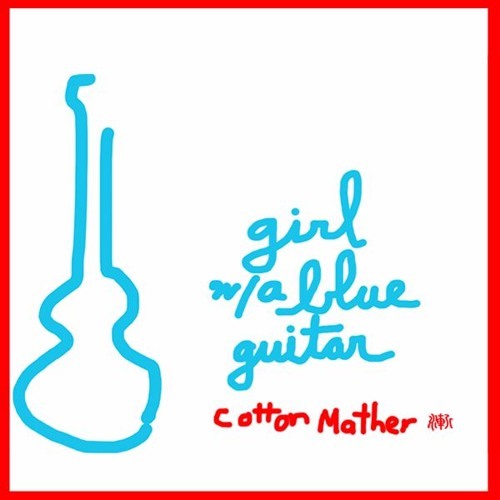 Atwood Magazine is proud to be premiering Cotton Mather’s “Girl with a Blue Guitar,” the latest release off the band’s upcoming four-track EP Girl with a Blue Guitar. A guitar-driven rock ballad recalling the likes of Tom Petty, George Harrison, and Wilco, “Girl with a Blue Guitar” echoes with “classic” rock leanings, its lyrics painted with a story that may or may not all be a dream. The “girl with the blue guitar” – is she a dream, or is she a reality? A seeming ideal, the girl is neither and both – she is something (or rather, someone) we might aspire to know or have in our life. Harrison’s lyrics blend the real and imagined worlds until it’s not worth wondering who the girl is, but rather, our time is best spent asking what she represents. “What do we really want and need from the other? Companionship? Forgiveness? Acceptance? A witness? Yes! All that. And I’d say for myself – someone with and through whom I can touch the very ground of existence.” Harrison describes his works as “song reactions to illuminations from the I Ching about life unfolding.” Some of the songs directly reference the text, whilst others use readings as a guide or outline. Accompanying each song is a “commentary” about its hexagram reading. At the end of it all, Harrison’s multimedia project might look more like a thesis than an album, and its depth of thought and care will make it that much more impressive. The final changing line of the reading, apropos to the atmosphere of this song, talks about the loftiest kind of love we can experience with another, signified by a single swan flying high in the clouds, whose falling feathers bless all below. My interpretation of this line is that it identifies a most powerful love which emanates from a place of elevation: the vertical dropping into the horizontal plane; timelessness entering time to render stillness; the eternal revealing itself through a momentary dissolution of the ephemeral. How appropriate that love is used as the vessel for teaching about gradual progress, and vice versa. Love cannot happen overnight; its strength comes out of repetition, nuance, exposure and much more, but most important is time. Thus, we aspire to the girl with the blue guitar, and perhaps in time her presence makes itself known to the individual. Harrison titles his commentary “Might Get Fooled Again,” because that’s what happens, isn’t it? We try, and try again, following that vision of love that we see in movies, that we’re told is true, and that we know will eventually happen to us. We get knocked down, sometimes – most of the times – but we start over, in pursuit of something more. Thus, the girl with the blue guitar is a prophecy. While Cotton Mather exacts energy and purpose in the lyrics, the song’s music is slightly lacking in the same emotive quality. Its straightforward exposition and blasé guitar solo confirm Harrison’s lyrical focus, but what results is a song whose fascinating meaning might be lost on many due to its surface-level appearance. Nevertheless catchy and nostalgic, “Girl with a Blue Guitar” is an exciting addition to Cotton Mather’s Songs From The I Ching repertoire. It should be experienced with its commentary (available at ichingsongs.com) for full effect.